If you’re fairly new into DSLR photography and walk into a shop, the Canon 6D and 7D Mark II might seem fairly comparable. The cost range is essentially the same at that $1800usd price point. Of course, the two cameras couldn’t be more different. The 7D Mark II is a high-speed shooting action body with a crop sensor, whereas the 6D is a slow-shooting full frame that has been built to appeal primarily to landscape photographers. And, sure, if you’re deciding between the 6D and the 7D Mark II and shoot either landscapes or sports/wildlife primarily, the choice might be obvious. But what if you’re a travel photographer and shoot a wide range of imagery? Which of these two cameras fills the needs of your professional travel photographer or photography enthusiast heading out of a photography vacation? To help you decide between the Canon 6D and 7D Mark II, I compared the two in the following video. Of course, there is an article with some photo examples below as well. To compare these two bodies, I thought I’d run through some of the specs and compare how I felt using each body out in the field. And, please note that I’m not going to count up the scores given to each body and decide a “winner”. For one, I don’t think there is a winner; each photographer has their needs. And, two, each item has different value to different people. So, I’m just going to toss out my opinion and let you decide what’s important. The main reason I went full frame with the 6D was because I wanted better noise handling, and the full frame sensor does this very well. On my old 60D I was lucky to be able to shoot an image at 640ISO without showing noise issues. On the 6D, I felt like I had no issue shooting as high as 3200ISO and even at 6400ISO I still get usable images. This will come in handy especially when I’m shooting portraits on the street using natural light. Before, I wasn’t able to bump the ISO for faster shutter speeds, now I am. Also, the dynamic range on this camera is really top notch. I noticed that the first time I shot a landscape with harsh backlight. It really pulls a lot of range. I was actually incredibly impressed with the sensor of the 7D Mark II. For a crop sensor, it must have the best noise handling capabilities on the market. I was able to shoot 1600ISO without issue, and that’s fantastic. It starts to get some noise artifacts at 3200ISO but nothing too dramatic. So, yeah, in comparison with the 6D the noise handling isn’t quite there. But, compared to any other crop sensor DSLR I’ve ever used, it’s spectacular. The other advantage to the sensor for the 7D Mark II is that it has that dual pixel cmos sensor which is helpful if you’re shooting any video. 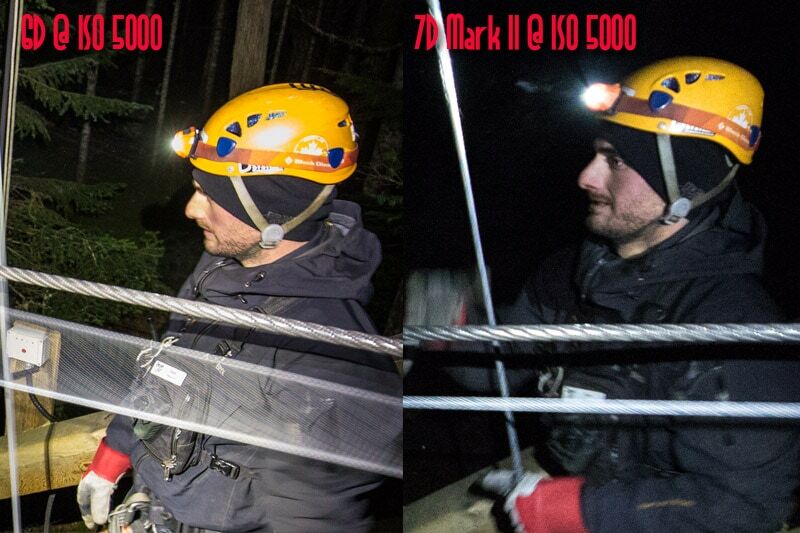 As you can see, at 5000ISO the 6D is superior. It should also be noted that the 6D image was shot with better light so attracted less “shadow noise”. The 7D Mark II made waves within the photography community because of it’s autofocus capabilities. And the truth is, it holds up to the hype. The 65 autofocus points are all cross type, and the various autofocusing modes allows you to let the camera do a lot of the work which really comes in handy in action situations like sports and wildlife photography. For me, the best part about the various autofocus points is that they really cover the entire viewfinder. So many times in a body you’ll get 15-30 autofocus points but they are all stuffed in the middle of the frame. It makes it hard to compose your images the way you’d want. You do not have a problem with this body there. Shot on the 7D Mark II. So many keeper images using that body. The 6D was given a very hard time about it’s autofocus system from the get go. In fact, having only 1 cross-type autofocus point (11 in total) was one of the reasons many vendors think the 6D didn’t sell very well. And the truth is, it is a problem when shooting action. Well in Whistler, I found myself forced to frame a lot of the athletes into the center of the image because I didn’t trust the other autofocus points. It was a problem. That said, the autofocus capabilities of the 6D shine elsewhere, especially in low-light, and, really, that’s what the 6D was made for. To test, out in the field I’ve been shooting the autofocus even in extreme low-light to see how it handles, and it rarely misses. In fact, out on location at Crescent Falls, it didn’t fail a single time. I noticed it too photographing the fire and ice show in Whistler, the 7D was having a bit of a hard time picking up the focus whereas the 6D was much quicker in the dark. So, even though the autofocus only has one cross type, if you’re shooting lots of low-light landscape, you’re going to love this body. Shot on the 6D. I’d say the majority of my sports images were sharp. Both of these bodies have their advantages in build quality depending on what you’re looking for. The 6D is extremely light and built out of mostly magnisium allow with a bit of plastic melded in. It is weather sealed when matched with a weather sealed lens. The advantage is obviously that it remains light. Whether it can hold up to the rigors of the world of travel photography is a question only time can answer. But, for the most part, it seems pretty sturdy. The 7D Mark II, on the other hand, is built like an absolute tank. Canon claims that it’s 5x more weather sealed than the 7D, which I think is an absurd statement. If it’s sealed, it’s sealed. There shouldn’t be levels of weather sealed. But, regardless, the build quality is fantastic and I’m fairly sure you could drive over it with a half ton truck and have no issues. The build quality is said to be on par with the 1DX, and it certainly feels it. Of course, that strong build quality means that, at 820 grams, it is fairly heavy and significantly heavier than the 6D. The beauty in both these bodies is the value. The 6D is Canon’s most affordable full frame DSLR and one of the main reasons I bought it was that price point. That said, it’s value lies almost entirely in the sensor and little bonus features like the WiFi and GPS. Personally, I think Canon would have done better for themselves creating a 6D that had closer to 24 all cross-type autofocus points and charged an extra $400. So yeah, the value is great but I think the value would have been better with a better autofocus system and higher cost. The 7D Mark II’s value is tremendous. In so many ways, it’s a 1DX with a crop sensor. Thanks to a much improved sensor, the 7D’s ISO capabilities make it a great go-to wildlife and sports lens that lots of pros will choose to go with. Moreover, there’s value in the fact that you can use the 7D Mark II with crop sensor lenses which are quite a bit cheaper, especially at the wide angle. For example, the Sigma 10-20mm is about $400. Whereas the cheapest full frame option, the 17-40mm Canon is more than double that. The frame rate of the 7D Mark II was a pleasant surprise to wildlife and spots photographers. Shooting 10 frames per second makes the 7D Mark II the second fastest camera of all the Canon products. In fact, it’s almost at the same 12 frames per second level of the 1Dx which costs 3 times more than this body. Testing this capability in Whistler, we never missed a single moment in the field. The frame rate of the 7D Mark II combined with the fantastic autofocus means never missing a frame. As for the sound of the shutter, it’s much improved on the old 7D. It has a bit of a springing mechanical sound, but it’s quieter than before. The 6D is not meant for speed, pure and simple. It only shoots 4.5 frames per second and shooting an action sequence on this body is a bit slow. 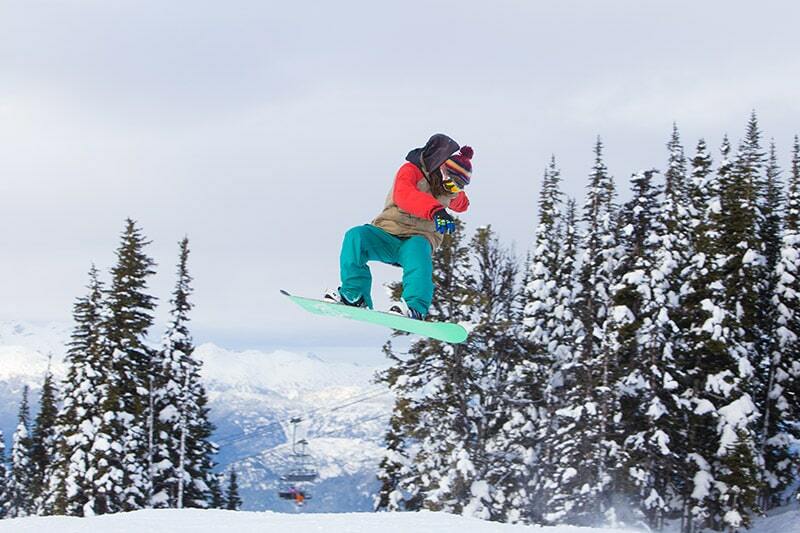 There were a couple occasions shooting in Whistler where I felt I missed the key moment because of it. It’s not terrible, and if you don’t shoot a lot of action, it can get you by in a pinch. 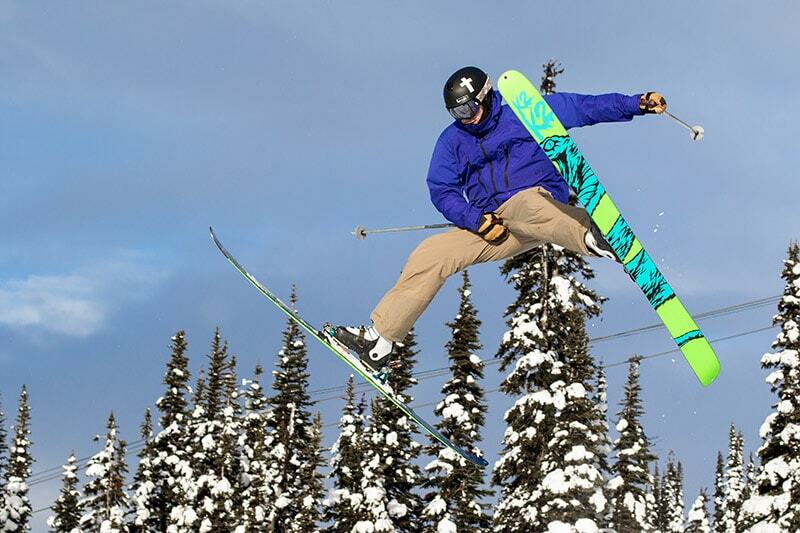 However, I wouldn’t be buying a 6D if I was planning on being a sports or wildlife photographer. On the plus side, the shutter for the 6D is nice and sensitive and extremely quiet. For nature photography, the click of the shutter doesn’t cause any sort of disruption. Also, the fact that the shutter is so sensitive means that there is very little camera shake when pulling the trigger. 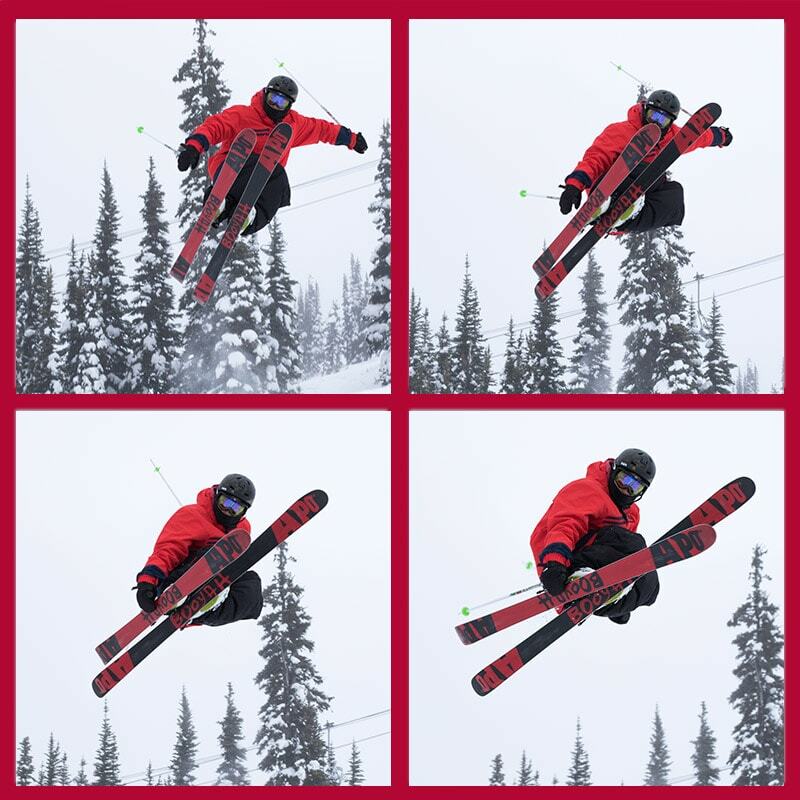 Image sequence from Canon 7D Mark II. Each of these cameras has some bonus features, but the 6D likely has a bit more on the back end. The two most popular features of the 6D are the built in WiFi and the GPS. Now, truth be told, I thought I would use the WiFi on the camera a little bit more than I have. But, that might be due to the fact that I don’t use an iPhone and there is no Canon app on the Windows Phone as of yet. The GPS, on the other hand, I have turned on all the time, and I love that it tags the location of my images. The only issue with the GPS is that it doesn’t shut off even if the camera is turned off. It drains the battery pretty hard. So, if you’re done shooting, you have to remember to turn it off. The 7D Mark II also has GPS and the same issue of needing to shut it off or it draining your battery. What it doesn’t have is the WiFi capabilities. And, the truth is, I don’t really see that as much of a loss as I did before. If you really need WiFi you can always just get yourself a set of EyeFi Cards which essentially do the same thing. The other big feature of the 7D Mark II is the built in intervalometer. I love that the intervalometer is included in the 7D Mark II as it means I don’t need to pack one around separately, and essentially don’t need to include something like Magic Lantern on my memory cards. Who Should Buy the 6D? The thing about more affordable cameras is that you need to compromise. So, you have to decide what’s most important to you. I went with the 6D because I shoot a lot of tripod images and street photography and prefer the high dynamic range and ISO capabilities the 6D offers. Yes, I shoot some wildlife and even sports at times, but not enough for the framerate or autofocusing capabilities of the 7D Mark II to sway me to the crop sensor. So, if your photography is geared towards nature, landscapes, portraits, architecture and mostly still life, the 6D is a fantastic camera and will treat you very well. Should I Buy the 7D Mark II? The reason Tiffany ended up going with the 7D Mark II is because of the value it has as a body. You essentially get all the bells and whistles of the 1DX with a crop sensor for a third the price. Moreover, if you’ve been shooting a crop sensor before, you don’t need to replace all your lenses like I did when I bought the 6D. From a travel photography standpoint, the 7D Mark II can do just about everything you need. If you don’t really care too much about being able to shoot extremely high ISO, there is no reason not to get the 7D Mark II. It’s durable, fast, and captures incredibly high quality images. If you shoot lots of wildlife, street life, and sports this is the perfect camera for you. Although, it really will get you through nearly any situation. It’s interesting to think about the value of sensor quality versus all the other aspects of a camera body. For example, despite the fact that the 7D Mark II is superior to the 6D in nearly every other aspect aside from the sensor, I went with the 6D. On the other hand, Tiffany did the opposite. Personally, I think that the 7D Mark II might be a more versatile option that the 6D. So, if you’re not really worried about high ISO shooting or full frame resolution, then the 7D Mark II is probably the best option for you. After using the two bodies, I don’t regret my decision to buy the 6D. I have wanted to go full frame for years, and am glad I did. However, I do see all the advantages to the 7D Mark II and really think that body is a game changer. And, if I ever have the money or need to buy a back up body to replace my 60D, I’m pretty sure it’ll be a 7D Mark II. My US road trip continues with my next article and video with a 2 day hike into the incredible Havasu Canyon for some serious waterfall photography. Then, the road trip takes full swing with our first couple destinations being White Sands National Monument and Guadalupe National Mountains Park. Stay tuned! I Like Very much Canon 600d is using now .can i sent my photograpy . Have either of you been in a situation where you wished you had the other camera? I’m glad it’s helpful. And, yes, I’ll answer that question. I wished I had the 7D mark ii whenever I take wildlife or action images. Every single time. Tiffany, I think she wishes she had a full frame Canon 6D when I shoot stars, or low light portraits. The comparison between the Canon 6D vs. 7D mark ii is tricky because they are such different cameras meant for completely different things. I guess, you just have to determine what you shoot the most of and compromise on the rest. It’s very help full for me. I was very confuse to buy the right one between 6d and 7d mark II. Now I’m clear what I need. Glad it helps Krish, let me know if you have any other questions at some point. Hard to answer that James. If you shoot a lot of high-iso stuff, the 6D is far better when it comes to noise handling. That said, the 7D mark ii holds it’s own with noise up to about 1600ISO which is amazing. My opinion is this: the 7D mark ii is superior in all manners to the 6D with the exception of sensor quality. If you’re used to shooting a crop sensor, the 7D mark ii is essentially a pro camera with a crop sensor. It really is fantastic. I struggle a bit with the 6D on moving subjects, but the image quality, sharpness, and noise handling is amazing. Again, it’s a really tough choice. But, if you don’t mind having a crop sensor, I’d say go for the 7D mark ii. 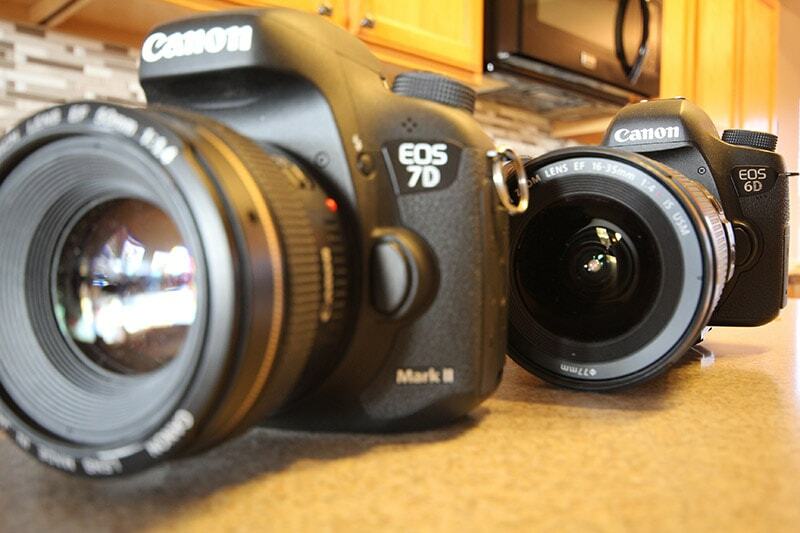 In comparison to the 70D, both the 6D and 7D mark ii are better. The 70D is a good camera, but it’s a hobbyist camera whereas the other two are professional cameras. Hope that helps, I know the choice is difficult. I shoot everything as well, and if it wasn’t for the fact that I love taking portraits, I would have got the 7D mark 2 I think. Best of luck, and let me know what you come up with! I photograph severe weather, I own a rebel xsi now, which I purchased a few years back as my first DSLR. I am looking to upgrade and wanted to get an opinion of which camera out of these two to purchase. User your heading for who should by a 6D you stated “and mostly still life”. Do you think a tornado would be too fast to capture with the 6D to have crisp pictures? I think the 6D is a better option than the 7D mark ii for this Scott. You’ll be able to shoot higher ISO and get far cleaner images than you’ll get on that XSI, for sure! I include weather in still life since you’ll essentially shooting landscapes (even if they are moving). I think getting a 6D and a 16-35mm f/4 would be an awesome pairing for extreme weather. I shoot a bit of everything which also includes classical concerts. Would the 6D be the only logical choice? I understand its low light abilities, but I also like the idea of having a crop sensor for the extra reach. The autofocus of the 6D sounds like it will be challenging with any moving subject so I’m leaning toward the 7D ii for this reason. Any help with this quandary would be appreciated. I don’t blame you in thinking about going for the 7d mark ii. Let me tell you that after 4 months of having both cameras around, the only thing the 6D does better than the 7D mark ii is handle noise. AND, the 7d mark ii handles noise better than any crop sensor on the market that I’ve used. Honestly, the image quality on the 6D is absolutely superb, but for all purpose shooting, and someone who really wants that extra reach, the 7D mark ii sounds like the right choice for you. Thanks for your advise, look forward to hear your thoughts. It sounds like you should go for the 7d mark ii. The only thing you wont be able to do is use wifi, but you can use an EyeFi SD card to get around that issues. Also, the noise handling on the 6D is far better than the 7D mark ii for star photography. 2 – Hands down the 7d mark ii. The 6D is not a good wildlife body. HOWEVER, it is an amazing landscape body. But if you need to shoot wildlife, you’ll want the 7d mark ii. 3 – The 6D is better here. 5 – Both have GPS. Best of luck with the decision. Really useful – and answers the niggles I had been having regarding the 6D but has now replaced it with the option of the 1Dx. Really interested in full frame – do the same arguments stand up against the 1Dx also that you have highlighted for the 6D? Appreciate this is slightly off topic but…. Yeah, same arguments go. The big difference is that the 1DX also does all the things that the 7D Mark ii does. Honestly, the only advantage the 7D Mark ii has over the 1DX is the price. Will opt for the 7d Mk II and use the resulting cash difference from not getting the 1Dx on a new lens. Appreciate your comments, thanks very much. Good call! The 7d mark ii is fantastic. You’ll love it. I’m also on the fence between the two cameras. I’ve dabbled in photography more than than years ago (using Nikon N80), but I didn’t have enough time then. Now that I have a daughter – I want to get back into photography. I would mostly use the camera for taking pictures of my daughter (she’s 8 months) and for travel. We have an upcoming trip to Hawaii, but I don’t think we’ll do much hiking this time. So, mostly pictures of kids, landscapes and indoor shots. I would also use it for real estate photos (indoor with wide angle). Both cameras are now almost equally priced, so that is not a decision maker. My only concern is 6D being rather old and it’s replacement will not arrive until early 2016, which is too long to wait. I was thinking about getting 7D2 now and upgrading to FF later or just giving 7D2 to my wife and me getting a FF camera in couple of years. So, what do you think? Thanks. I think for what you’re looking to shoot the 7DII would do the trick for sure. But, your concerns about the 6D probably don’t pan out. It’s still an amazing camera, and the sensor is amazing. I think if you’re considering moving to full frame at some point, it makes sense to just go with the 6D now or else you have to replace all your lenses later on. So, it doesn’t really come down to 6D vs 7D Mark II, but will you eventually move to full frame. Thanks for quick reply. I definitely want to move to FF. I also plan on buying EF 24-70 f/2.8 L lens, which is compatible with both cameras, and another wide angle zoom. I’m planning to upgrade later (to 5D mark 4 most likely) at which point I would keep 7D2 or 6D as backup and for my wife to use. I think right now I can get 6D for $200 cheaper than 7D2. So, my decision is also based on which camera will be a better second body (or for my wife) later. I’m mostly concerned with single cross-type AF point on 6D – I am not very experienced and I’m afraid I’ll end up with higher count of out of focus shots. Do you think that is reasonable? Thanks. Well, if that’s the case, the 7dm2 is probably the best option on the grounds that it’s a different type of camera. It’s nice to have a crop sensor in the bag for more distance on the long lenses, and the 7D Mark II is such a quick camera that it can pack a punch photographing sports and wildlife. So, yeah, I’d go with the 7d Mark II if you’re considering it as a back up body. Thanks for your input. I ended up finding a great deal at Adorama – got Canon 6D w/ 24-105 f/4L and Lowepro bag for about $1,350 after Canon rebate and after selling the extra audio gear and Pro-100 that came with it. With left over budget I got EF 85 f/1.8 and 430EX II. I’m blown away by the results! Thank you so, so, so much for the great comparison. Really appreciate your time and effort and objective review. Most helpful review I’ve read, and I read a lot! Not for your lack of trying, but I still don’t know which one I want! I mostly do photographs of my family, which includes portraits and A LOT of sports, including indoor (basketball). Obviously the answer is I need both 🙂 but sadly, budget will not allow that! Honestly, if you shoot any sports at all get the 7D mark ii. I have a really hard time shooting sports and wildlife on my 6D. And, the 7D mark ii will do well for portraits as well. As the owner of a 6D, get the 7D! haha, I know it’s limitations. I love it for landscapes and still portraits, but it really lags for moving subjects. Thanks for the review it is very helpful. I mostly take portrait shots, senior pics newborn, family and sometimes wedding (outside shots as well) I am considering the 6D. But the 7dm2 sounds great as well. Haha, if you shoot mostly weddings and portraits, go with the 6D! Hi Brendan – a superb round up. I’m lucky to be an owner of both (actually, sharing them with my sister) – I’ve had the 6 for over 2 years, and recently bought the 7dmk2. Why? Well – one because we needed two bodies between us – we live a reasonable distance apart. And secondly, because although I was in a position to get a 5d3 or another 6, the 7d2 just made an awful lot of sense to have to completely complement the occasional deficiencies I had in certain situations with the 6. I will say this – you cannot go wrong with either of these cameras in 90% of situations if you’re willing to put in some time and effort to learn how to use them and work out ways round things. The 6 is an astonishingly capable and beautifully simple to use camera. And I really like the Wifi – it works great with a third party android app called DSLRController which acts as a really powerful remote. The 6’s downfall was (as one might expect) with shooting sport and wildlife. I did take some shots I really love with it – but I was always using single focus point back button focus and recompose. Once I got used to it, it was fine, but you got that feeling you were working very hard. What wasn’t a problem was the image quality when you got the shot – it was brilliant. However, for far away subjects, I also found myself needing to use an extender on the full frame, and as I have the 2x ii, it wasn’t optimal for fast stuff. The 7 completely rectifies these issues – the autofocus is astonishing, and, because it’s a crop – the crop factor makes that 200mm lens into a 320 for all intents and purposes, which does the trick without needing the extender most of the time. The 7’s issues, coming from the 6 are not what I thought they’d be. I was expecting a significant downgrade in general lowlight performance and overall IQ, but have been more than pleasantly surprised with the quality. Only extreme lowlight, say astro stuff sees the 6 make a big difference imho. One bigger *initial* issue – this is a substantially more complex camera to operate to what feels like is it’s potential then the 6. The 6 is a point and shoot in comparison – and I mean that as a complement! But after spending some time learning it, it’s terrific. My only regret in the 7d purchase was not picking up the pack with the 18-135 STM – i.e. the ef-s. I bought body only as I thought I’d be covered with my lenses, but I think that would have made a really nice walk around one when its my turn with the 7, vs the 24-105L EF lens. It wouldn’t have added a lot of money at purchase time, but I cut a corner – we have the 18-55 basic from a 450d, but that’s a little short sometimes. My recommendation to anyone buying the 7d in a similar situation who only has full frame lenses is get it with that 18-135. Thanks again, and hope that helps anyone else who is considering buying one of these great cameras. If you are in a position to buy the 5dmk3, I would strongly urge you to consider the possibility of buying both the 6d and the 7dmk2 instead for similar money if you don’t need to have (almost – the you’ll miss the 6d’s wifi and simplicity, and 7d’s autofocus and crop factor – oh and the GPS on both) everything on one body all the time. It really does offer best of both worlds! Hi Ray! Thanks so much for your input. I’m sure that readers will be really grateful for that bit of insight!! No probs – thanks for the great site! Interested to know what you think about owning both vs a single 5dmk3…do you also think it makes sense or am I missing some major advantage of owning that one instead (other than the obvious situation of doing many types of photography seriously in one day, which in reality I don’t seem to do a lot – I’m either doing one thing or another)? I think having both is absolutely the best. I love having 2 bodies for completely different things. It also means when you’re out shooting you can have a long lens on the 7d and wide angle on the 6d. For me, I love having that ability without having to switch lenses. I don’t think you’re missing out on anything. I’m looking between the 6D and the 7DMK2 at the moment and I too am struggling to choose. I’ve read through all the comments above and I think I lean towards the 7D but wanted your thoughts.. I love street photography and portraits but I do want to try more landscape photography as I am surrounded by great views. Would getting the 7D hurt my efforts at landscape to a sufficient point where you’d say, consider the 6D? I have started going to more sports events held indoors and outdoors so the 7D AF and FPS could be incredibly useful for more here. I guess as stated many times above compromises have to be made as if I needed a do it all camera, I’d be looking at spending considerably more! I guess the trouble is the more I look at the images taken on the 6D, the more I think they look rather nice. I think if you’re doing regular landscape photography and shooting ISO100 most of the time, the 7D is going to be fine. If you’re wanting to do star photography, you’ll want the 6D. I think, personally, it sounds like you’d either be best with the 7D Mark ii or wait until the 6D mark ii comes out with more autofocus points. It can be thouroughly overwelming with all the reviews and opinions out there but I think I’m starting to workout what will fit me best. Is there any rumours on an ETA for a 6DII? Rumors for the 6D Mark ii are out there. It looks like a significant upgrade. I too am one of the many struggling to decide between 6D and 7D MKII. I always wanted to take a FF camera that fits the budget and 6D seems to be a great fit. However, 7D MK II seems to be giving more bang for the buck. I am interested in outdoor(mostly still), portraits and occasionally child photography. My question is, how bad is the AF on the 6D? Is it plain bad, or something which one can live with for the superior image quality? For reference, I am upgrading from a T3i/600D and really want to up my game. Any suggestion greatly appreciated! The AF is terrible for action on the 6D, but it wouldn’t be any different than the T3i. So, it wouldn’t feel like you’re losing anything. If you’re shooting mostly still, or slow life, you’ll not be bothered by the AF on the 6D. Aside for the auto-focus, I love everything about my 6D. It really is a great body. The 7D mark ii is probably not what you’re looking for in terms of portraits and still life. It’s more useful for wildlife, and sports. Thanks! I got the 6D eventually and I am loving it! Takes great pictures in low light! Glad to hear you’re liking the 6D! You’re right, amazing camera in low-light! HI.. Your article is very informative. I have got a clear picture to choose between 6D and 7D mark ii with regards to Photography. But i need your choice for a good video camera. I wish to take lot of short films. Let me know which is best for videos?? Thanks in advance. 7d mark ii has the dual cmos tech and 60fps video, so it’s likely the better choice for video. Obviously, the 6D handles better in extreme low-light. But, overall, I think the 7d mark ii wins in terms of video. Thanks for your suggestion 🙂 I am going to use the camera for general photography more of event, family, trips, portrait. Since my wife is an artist, i need to make videos of her work, her close up shots of paintings. I am also interested in making short films in interior and exterior places. I have selected 7D mark ii for my use. Let me know if my choice is correct. Just saying again, this article is too good. I even saw your video review. Thanks a lot for clearing lot of doubts. Hats off.. I have a windows phone too, so don’t have access to the Canon Mobile App. Still stuck on this decision though, really really cannot pick one out of these two great cameras. Thanks so much for all your helpful information on the Canon 7D Mark II and Canon 6D! You’ve helped a lot of people with this important buying decision! Would you please help me, too? Here is my background: I currently own a Canon 40D. I got it very cheap on Craigslist and I love it. But I am ready to “move up” in terms of sharper images, more choices, more creativity, and better opportunities by upgrading my camera. I am a traveler, and go to India every other year as a college study tour guide. Our experiences in that country include a variety of circumstances, geography, weather, lighting, and locations. Typically I come home with 3-4 thousand images. The bright sunny day pics are wonderful (of course!) The dusky and inside temple pics are grainy and often blurry. Flashes are unwelcome most of the time where we go. Besides, it’s not great etiquette to flash a person you don’t know in the night time! Thanks for your input! Truly I appreciate your thoughts! Of course I want a good camera for family, friend pics as well, and trips to places other than India, but this is my most varied environment of a singular trip. I personally think that the 7D mark ii would be the right move for you. It’s a fantastic camera, great in low light and the auto focus is amazing. It might feel a bit overwhelming jumping to it from the 40D, but you’ll figure it out quickly. The other advantage is that you wouldn’t need to buy new lenses if you have crop sensor lenses for your 40D. The 6D is brilliant, but I think that I’d either get the 7d mark ii now, or wait until the 6D mark ii comes out late in 2016. Thank you very much for sharing your insights. I am just getting back into digital photography and the most challenging photos I am finding are of my son fencing. The action is very fast and unpredictable, and the lighting in the competition venues is sometimes marginal. so on my old 30D, I have turn the iso way up, but then the noise gets unacceptable. So looks like the the 7D MarkII is probably better for me even though the useable ISO range is not as high as the 6D,right? Also I am thinking to get a lens with a wider aperture to let in more light than the kit lenses I have. I usually can position myself 20-30 ft from the action. Would the EF 24-70 f2.8L II be a good match with the 7D MarkII? Definitely, for fencing you’ll want the 7D mark ii. The 24-70 would be great for fencing I think, depending on your style. Might also be worth it to pick up the prime 200mm f/2.8 for some tighter shots too. I am starting out in photography, looking at completing some short courses to learn all the fundamentals of the camera. My goal is to eventually become a professional wedding photographer, as well as photographing family portraits, beach scenes & landscape photography. I am very confused as to which camera is the best option for me? Also my style of wedding photography is outdoors, lots of natural light etc. however given every client will be different this will differ from time to time. I would ideally love to buy the ‘Canon 5D Mark111’ however as I am starting out this is unfortunately out of my price range. Any guidance or advice would greatly be appreciated. For wedding photography you almost definitely want a full frame camera. The 5D is your best option. However, the Canon 6D will also get you by and save you some money in the process. I’m a few years late to the party but thanks for the comparison nonetheless! Helpful while I weigh what I want to do with my 6D and various crop bodies and lenses I’m trying to pare down.